Breathe Right nasal strips gently open nasal passages so you can beathe through your nose and close your mouth, reducing snoring. Athletes also use nasal strips to reduce the amount of energy needed to breathe during a workout. Breathe Right nasal strips are ideal for every kind of aerobic exercise. 1. Correct placement makes sure you get maximum performance. 2. Wash and dry your nose to remove dirt and oils. (For oily skin use an astringent.) 3. Remove the liner and place the strip on your nose. Rub gently to secure. Patented dual flex bars gently lift open nasal passages to immediately help you get more air. 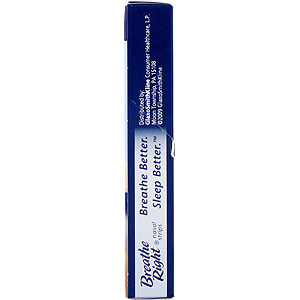 Breath Right Vapor Strips: Gently scratch the surface to release the soothing mentholated vapors. Scratch again to reactivate. They were handing out samples at Manhattan and I decided to try it. It's amazing! I no longer have to be waking up in the middle of the night thirsty for water. I now sleep with my mouth closed the entire night. I am definitely going to start purchasing these! Chris "Really opens things up"
The instant I applied one strip onto my nose I could feel things start to open up and more air going in through my nostrils. They stay attached the whole night. Within each Breathe Right strip are flexible, "spring-like" bands. On the underside is a special adhesive that, when placed properly on the nose, gently sticks to the area right above the flare of each nostril. As the bands attempt to straighten back to their original shape, they gently lift the sides of the nose and open the nasal passages ?providing immediate and continual relief. Your nose is divided into two chambers, or nostrils. At the back of each nostril is a narrow space called the nasal valve, which is only 1/10" wide. All of the air you breathe in through the nose has to pass through these spaces, which can become blocked for a variety of reasons. The Breathe Right strip widens the space by mechanically pulling open the flexible cartilage walls of the nasal valves, making it easier to breathe without the use of drugs. 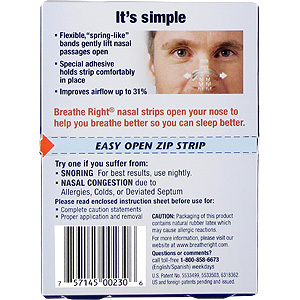 What is a Breathe Right nasal strip? The Breathe Right nasal strip is a drug-free, non-prescription device that workds mechanically - from the outside - to gently open nasal passages. This reduces the resistance to air flowing through the nasal passages and improves the ability to breathe through the nose. Who can benefit from this product and when is it used? People who want to improve their nasal breathing with a drug-free device will benefit from using Breathe Right nasal strips. The strips can be used whenever easier breathing is desired - while congested from allergies or colds, during exercise and sleep, or throughout the day. How do the strips work for nasal congestion? Congestion - whether from a cold, allergies, flu or other reasons - narrows the already small breathing space at the back of the nostril, making breathing through the nose more difficult. A Breathe Right strip widens the air passage to reduce the nasal airflow resistance and provides temporary relief from nasal stuffiness. 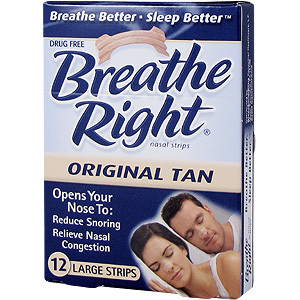 Can Breathe Right strips help with snoring? Yes! Most snoring is caused by mouth breathing. And you're more likely to breathe through your mouth when there is restricted airflow through your nose. So if snoring is due to an inability to breathe normally through your nose - and the majority of snoring problems are - then Breathe Right strips can reduce or eliminate the snoring by improving nasal breathing. Why are nasal strips used during athletics and exercise? How do they work for deviated septum sufferers? Millions of American's have a deviated septum - a bend in the cartilage or bone that seperates the nostrils. Symptoms include an airflow blockage through one or both nostrils, difficulty sleeping, chronic nasal stuffiness and loud breathing or snoring. While Breathe Right strips should not be considered an alternative to surgical correction, they can provide temporary relief by allowing air to pass more easily through the blocked nasal passage. Are Breathe Right nasal strips safe for anyone to use? Anyone can use Breathe Right strips, except children under five years of age. 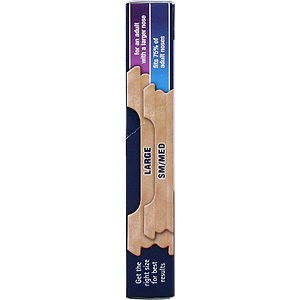 The strips are made with a medical grade adhesives and fabric. The Breathe Right nasal strips do not contain latex, however, the cold seal used to package the nasal strips is sealed with natural rubber latex, which may cause allergic reactions. Adult Nasal Strips Tan Large is shipped in a discrete, unmarked package. Orders are processed immediately and usually takes about 3 to 5 working days to be received. We do ask that you try it for 2 to 3 weeks to feel the full effects. Any information received is used only for order processing and shipping purposes. Your information, such as e-mail address, will never be disclosed to a third party.